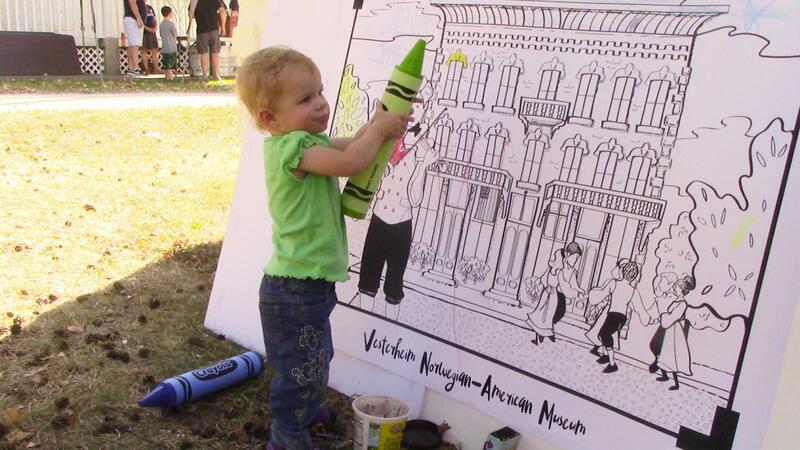 Nina Peterson, daughter of Assisstant Professor of History Anna Peterson, colors in the giant coloring book. The corner of West Water Street and North Mill Street was crowded with people Saturday Sept. 23 as the Vesterheim Norwegian-American Museum hosted its first Takkefest, a Norwegian harvest festival. Development Events Coordinator of Vesterheim Karla Brown said that the purpose of the event was to thank the community for their support; “Takk” means “thank you” in Norwegian. The event featured the Nordic Dancers, Decorah High School’s traditional Norwegian dance group, local Norwegian folk band, Footnotes, and Rochester area Americana band, River Jam. 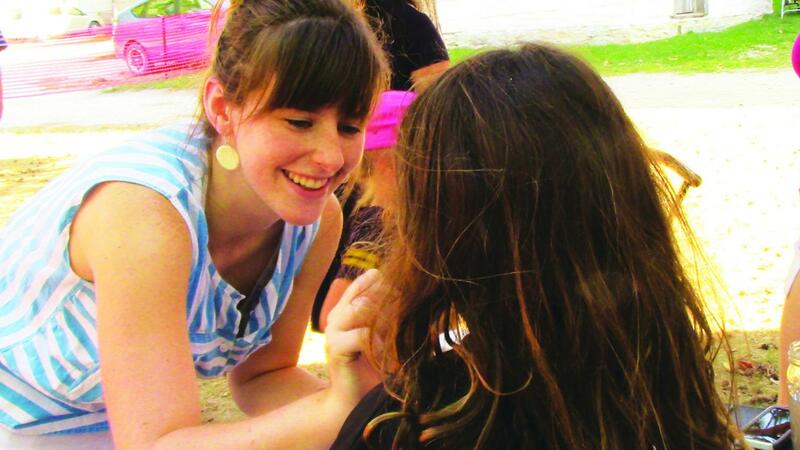 When attendees were not enjoying live performances, they participated in lawn games, folk art demonstrations, face painting, and a large coloring book project for children. Brown noted that the implementation of these activities is intentional in celebrating Nordic culture. The refreshments, a sprawling assortment of Norwegian treats, were provided by Luther College Catering, Impact Coffee, Pulpit Rock Brewing Co., and the Vesterheim Hospitality committee. In celebration of Takkefest, there were some uniquely “Decorah” treats. Ryan Koning (‘19) paints the face of a little girl durring the Takkefest. Takkefest coincided with the opening of the Knud Knudsen exhibit, which will be on display at Vesterheim for a year. The event featured a short film about Knudsen’s photography and a gallery talk by Exhibitions Manager at the Vesterheim Zach Row-Heyveld. Brown indicated that another purpose of Takkefest was to continue strengthening the link between Vesterheim and the Nordic studies department at Luther College. As a student involved in the Nordic Studies department, Chase Gilson (‘19) found his attendance at the festival valuable. Nordic studies and Art double major Alexis Hove (‘18) agreed that the partnership between the Vesterheim and Luther has been very important to her learning experience. President and CEO of the Vesterheim Chris Johnson is prideful in the positive relationship between Luther College and Vesterheim. He believes these are two important Decorah institutions. Johnson added that there are many opportunities for student involvement at Vesterheim. Johnson hopes that more Luther students will find ways to get involved at the museum.